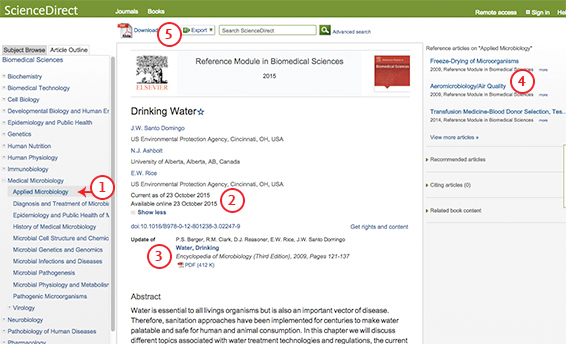 Share these tips on navigating Elsevier's Reference Modules with your patrons! The subject hierarchy at left shows you where the article you are viewing fits in the overall subject area. The “Current as of” date tells you when the article was last reviewed or updated. Clicking on the “Show more” link shows you the complete article history. All the articles in the Reference Module are continually reviewed by the editors. When an editor reviews an article they can take a couple of different actions. In this case the editor determined that the article needed to be updated, so it is current as of October 23, 2015, but you can see the previous version for reference. This time stamp is a key feature of Reference Modules. It tells the reader exactly how current the content…and therefore, whether it is good science. The Related articles box at right provide quick links to other articles under the same topic There are also introductory and advanced filters, enabling researchers, professors and students to filter the articles based on their level of knowledge on a subject.